In Building Background Knowledge for Academic Achievement, Robert Marzano explores the power of academic vocabulary and background knowledge to support academic achievement. In contrast to tiered high frequency words, academic vocabulary involves subject area terms derived from curriculum. Going beyond the ideal of providing regular field trips and mentors within the community, Marzano outlines two indirect approaches for supporting student learning: virtual experiences and direct instruction. In regards to supporting the learning of concrete terms, there are many ways of bringing in virtual experiences into the classroom. For some, experience comes via video, especially online, while others engage in the virtual through the act of speaking and listen. However, the most common format is through wide reading and participation within a sustained silent reading program. Summarising the work of Janice Pilgreen, Marzano suggests that SSR needs to focus on access, appeal, environment, encouragement, training, non-accountability, follow-up and time to read. In many ways, this connects with the process outlined in The CAFE Book by Gail Boushey and Joan Moser, where reading is broken up by regular conferences to provide encouragement and support. In addition to this, Donalyn Miller provides an interesting perspective on independent reading in her book The Book Whisperer. She presents a range of alternatives to breakup the usual habits, which include teaching readers rather than books, providing access to audio books, interacting with online reviews and creating book commercials. Allow for word play and focus on terms with high probability of academic success. Have students restate the term in their own words. Create non-linguistic representation, such as a graphic organiser or a Colour, Symbol, Image. Complete activities that add to the knowledge, including comparing, contrasting, classifying, as well as creating metaphors and analogies. Provide the possibility for periodic word play. For Marzano, the teaching of vocabulary needs to involve a whole school approach. However, some strategies to manage it is to use one book for all vocabulary, limit to certain subjects and split initial list between essential and supplemental. So what about you, what experience have you had in teaching vocabulary? Have you used Marzano’s work? If not, what did you use? 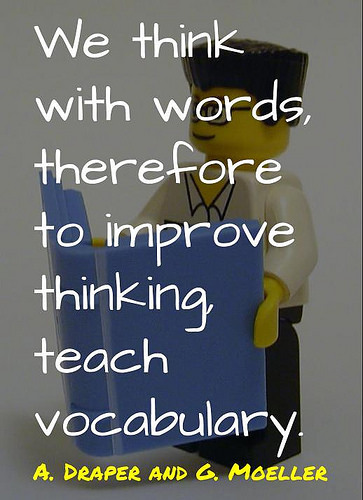 Also, what are your favourite vocabulary activities and games? As always, comments welcome. REVIEW: Building Background Knowledge for Academic Achievement by Aaron Davis is licensed under a Creative Commons Attribution-ShareAlike 4.0 International License.